sorry, but your findings are wrong ! 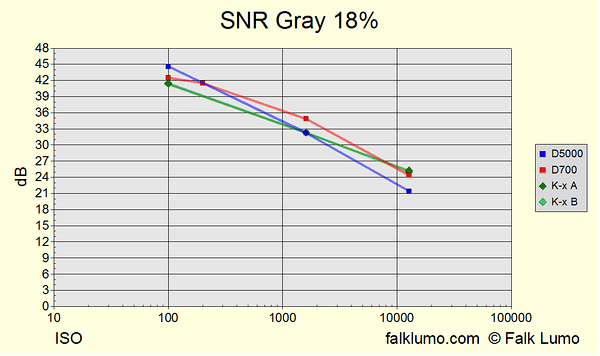 For example: Your diagram shows for the D5000 and 1% gray a SNR value about 32dB, but DxoMark shows a value of about 24dB. Maybe you are not able to read diagrams correctly. Please learn this now and please correct your nebulous findings ! @Anonymous, why do you think that DxOLabs results have to be the same? I reproduce part of their testing methodology for the SNR curve but use different color temperature and different data than them. E.g., I use demosaiced data from a process which I use as my standard (follow the forth link in my article's appendix for a description of my testing methodology). DxOLabs doesn't publish how they derive their input data but most probably they use data prior to demosaicing. I am able to read diagrams correctly and more. My findings are less nebulous than DxOLabs'. Feel free to run your own analysis software across sample charts as they are all online (unlike DxOLabs results which cannot be reproduced by independend parties -- on purpose, I guess, because they sell their analysis software). My process and publication method follows the principles of scientific routine meant to be verified or falsified by other serious workers. It is all online. Do your scientific homework and reply with a more qualified comment if your own findings are worth it. Thank YOu. Thank you for sharing your findings with the community! I am currently searching for a replacement for my trusty k100d super and had my eyes set on the k7. Now I'm wondering whether a k-x might do, given the excellent results. @RiceHigh, yes, the Full DxO curves are selectable for display when looking at a SINGLE camera's results. This option is absent in compare mode, though. Scientific tests have to be reproducable. This is the heart of science. But DxO doesn't publish enough information to be able to reproduce their data input into statistical analysis. Which is why results are expected to differ. My test results can be reproduced by any interested party. So, if I made errors, they can be found by others. @Falk Lumo: Thanks again for the tip (and your extensive k7 beta test). Sometimes, it's hard to tell from measurements how big the difference will be in everyday photography. I plan to have the camera with me as often as possible. 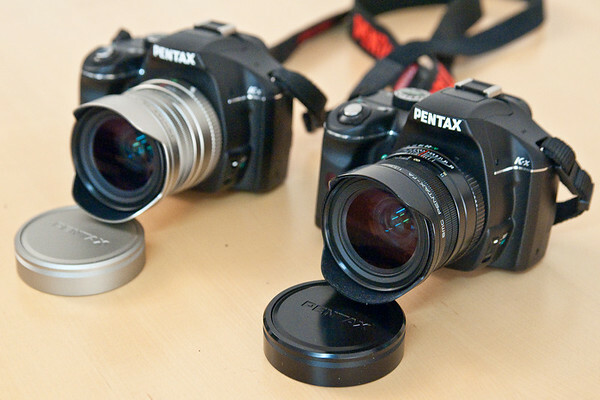 That's why I stayed with Pentax from MX days of yore: They do produce compact gear - and the best camera won't be any good when it's left at home, because it's too bulky. The k7 combined with the DA 40 will be a nice and light package, just like the k100d super. Wow, good stuff. I was contemplating buying the D5000 but now the L-x is a definite possibility. on a technical ground: you say "the SNR should decrease by at least 9dB when going from ISO 1600 to 12800". Why is that? I understand that 9dB is 3 stops, or eight times of a difference. And with 8 times higher sensitivity, you decrease the shutter time by a factor of 8, so the input signal for the pixel (defined as a number of photons) is obviously 8 times lower. But why do you assume that the input-referred noise is the same or higher for higher sensitivity? In fact, it this was true, than increasing the sensor sensitivity when taking photo would not make any sense - just underexposing would be a better option. I would rather think that when going from ISO 1600 to 12800, the SNR should increase by less than 9 dB (with no noise reduction applied). If you compare results for ISO 100 and 12800 (21dB increase), the D700 and K-x show SNR decrease of say 18 and 17dB, respectively. 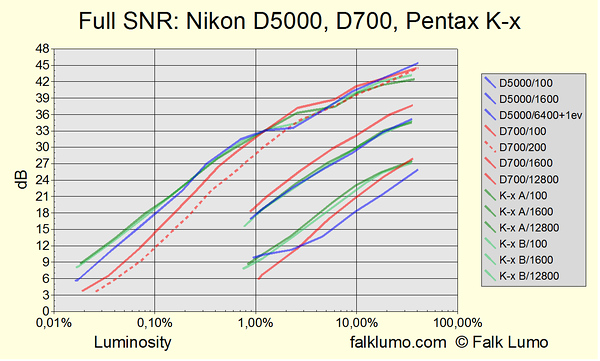 But the d5000 shows 23dB of SNR decrease. Does it mean that for the d5000, photo taken with ISO100 and underexposed by 7 stops (and then corrected for exposure in RAW developer) would have lower noise than photo taken with sensor sensitivity set to ISO12800, with the same aperture and shutter time combination?? @Pawel, good observation and therefore, let me explain: the 3dB/stop rule holds true for pure photon shot noise. For higher sensitivities, the read-out noise means that the decrease is faster (steeper curve). For lower sensitivities, limited well capacities can mean that the decrease is slowlier (flatter curve). But for a sensor with base ISO of 100 or 200 and between ISO 1600 and 12800, it nowhere should be flatter than 3dB/stop. If it is then noise reduction must be at work. Addendum to my answer to Pawel: I don't assume constant noise. Assuming constant noise would lead to 6dB/stop lower SNR. Pure photon shot noise leads to 3dB/stop, a sum of photon shot noise and read-out noise leads to anything between 3db/stop and 6dB/stop. Another addendum because not all people understand this: Read-out noise affects both dark shadows and high sensitivities. Read-out noise has two terms, one independent of ISO gain and one dependent on ISO gain. Switching the camera to a higher ISO setting helps reducing the read-out noise between the gain amplifier and the A/D converter. Thanks for the answer. Now some things are more clear - first, why do you expect 3dB SNR decrease for one stop higher sensitivity, and not 6dB :) For shut noise it is obvious. I was a bit surprised that your SNR analysis is mostly based on the shut noise, since this noise has nothing to do with sensor design. But I see from your plots that this in fact is the most important source of noise - please correct me if I am wrong, but if not, then the sensor technology is really close to fundamental limits! - so this methodology makes more sense to me now. By the way, it should be possible to find theoretical level of shut noise for given combination of shutter time, aperture and pixel area, right? Could be fun to compare the real noise level curve (as you show in section "ISO noise") with such theoretical limit curve. Not sure, however, how to take into account the effect of the on-sensor color filter. Anyhow, this is a very nice work that you are doing here. @Pawel, from a precise measurement of the SNR curve, you can determine both read-out noise (can become zero) and photon shot noise. From the photon shot noise, you can compute the full well capacity and sensor cell efficiency. From sensor cell efficiency, fill factor and bayer filter spectral sensitivity, you can compute the quantum efficiency. Quantum efficiency can already be as high as 40% and is limited to 100% by the laws of nature. 100% quantum efficiency, no read-out noise and no Bayer filter describes the fundamental limit. "the K-7 is the better camera. The K-x has about 1 stop less read-out noise. You must decide how much of your photography depends on read-out noise. Moreover, the K-7 has less noise in video (using more pixels). I own both cameras and most of the time, grab the K-7 "
Looking at the chart image you'd think the K-7 has the worst results... judging by the K-x results and thinking from a budget point of view would the K-x be a highly pleasing camera to buy still if I didn't want to spend too much?? @Anonymous, the K-x certainly IS a highly pleasing camera :) In this price range, the only other camera coming close is the Nikon D5000. But the K-x is smaller (even pocketable with the DA40 lens) and has in-body shake reduction. it would clear up many questions a lot of Us have. You'll find my comparison K-7 vs. K-x right here in my blog (back in October). I am using my K-7 without any hesitation up to ISO 1600. It is true that the K-x produces similiar noise only at ISO 4800 and therefore, I am using my K-x without any hesitation up to ISO 4800 (K-7 ISO 3200 and K-x ISO 6400 are comparable again). Thanks for this test. Will you be a doing a similar test for k-5? Don't care that much for D500, but a comparison between k-5, k-x and D700 will be very welcome. I've used the D5000, D5100, D700, and Coolpix A for a while, and one thing that I noticed was how I was consistently able to push the 200 ISO D700 RAW images more in LightRoom than ANY of the DX sensor RAW image files. Lot of other factors there such as processing, lens, and LR's algorithms perhaps, but what I'm able to do with the images seems consistent and even intuitive, and it's almost like the D700 RAW image file contains better color information in the shadows and highlights... which is not apparent when looking at just the RAW image files. Is this related to the sensor's Dynamic Range? Doesn't seem to correlate with DR lab test results, so I'm a little bit puzzled. One factor to point out is that the D700 usually has great glass, whereas the other cameras don't... but I'm not talking about sharpness here, perhaps the ability for the lens to transmit light and color.